Beaducation: The Blog: What is a Single Clad Blank? What is a Single Clad Blank? Two months ago our Director of Education, Kate Richbourg said to me, "I love our Silver Filled Blanks and they seem to be so popular, what do you think about carrying a Single Clad Blank?" "Single Clad? I never thought about it. Do you think we should get Copper on one side and Sterling on the other? What metals?" I asked. Kate thought Copper and Sterling would be perfect. When I approached the topic with Lisa Niven Kelly she said, "We should see if we can get them in 18 gauge so folks can stamp on both sides!" That's how we roll around here...teamwork! So I asked our manufacturer and guess what? He loved the idea! So there you have it. Beaducation now carries 6 sizes of circle blanks in Single Clad. Our Single Clad Blank is a Copper Blank with a thick layer of .925 Sterling Silver mechanically bonded to one side of the Copper Blank. 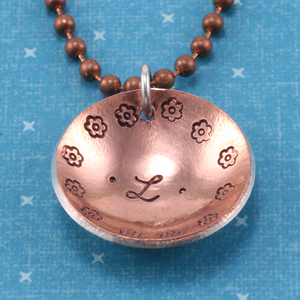 The blank is 10% Sterling Silver and 90% Copper. Because we have them made in 18 gauge, you can stamp a different design on each side. You can see how we did that in our first photo above. If you are dating two different guys, you can wear Jacob's name on a date night with him, and Sam's name on his date night! They are awesome for dapping too. The rim of the blank is also a thick layer of Sterling Silver, so if you dap with the copper side up you can see the Sterling edges all around, as Kate demonstrated on her 'L' pendant above. The Sterling side of the pendant is as smooth as a baby's bottom, but the Copper side does have sharper edges. We recommend tumbling the blanks or using a little steel wool on the Copper edges to smooth them out. We are so excited to finally have a blank that provides 2 styles in one and has the quality of a super thick 18 gauge pendant with a price that is affordable! How can you NOT love these? This is great! Neat design idea as well a wonderful alternative for people who love copper but are sensitive to it.